We believe, in no uncertain terms, that District Judge Alvin K. Hellerstein, got it very right to the extent of his available sentencing capacity when he sentenced Platinum founder Murray Huberfeld to 30 months and $19M. Judge Hellerstein understood the magnitude of the crime that Huberfeld perpetrated on the COBA members. He was clearly aligned with he notion that you cannot punish the bribed without punishing the person or people who orchestrated the scheme underlying that bribe. And Platinum Partners in all its glory was a scheme. Hellerstein recognized that Huberfeld’s “conduct was not only corrupt and criminal, but led to the loss of millions of dollars of union retirement benefits,” Manhattan U.S. Attorney Geoffrey Berman said. For Assistant US Attorney, Martin Bell, to agree with Huberfeld’s attorneys is ridiculous. With all due respect it shows a fundamental lack of understanding of our financial system, a lack of clarity with regard to Huberfeld’s long history of trampling on our legal and financial system and a lack of disregard for the victims of Platinum’s fraud. US Attorney Martin Bell should be celebrating the work he did that led to Judge Hellerstein’s rulings, rather than giving impetus for a litany of appeals on the part of Marty Huberfeld. Hellerstein’s assessment of the absurdity of this argument speaks volumes. Under legal regulatory guidelines a person who pedals an investment has a fiduciary duty to the investor, whether they know that investor or not. For a contrary argument to have even been raised highlights a lack of understanding of the SEC and the protections put in place to safeguard investments. Were COBA to have been an ERISA fund, the fiduciary duty would have been greater. These were the livelihoods of people at stake, their futures and those of their children and grandchildren we placed at risk. And Murray Huberfeld knew it the moment he solicited the investment and bribed Norman Seabrook to transfer funds. The COBA investments and the fiduciary duty of Platinum’s partners and Norman Seabrook are the very foundation of investment policy. And they are no less legally bound. The bribery and fraud underlying the loss of those investments was criminal. It lacked moral boundaries, put the foundation of the US financial system at risk and raises questions regarding the safeguards in place for investors. Assistant US Attorney Martin Bell’s comments, if not taken out of context in the various new articles, increases the magnitude of the risks that Huberfeld and those like him pose to investors, if appropriate punishments are not levied. 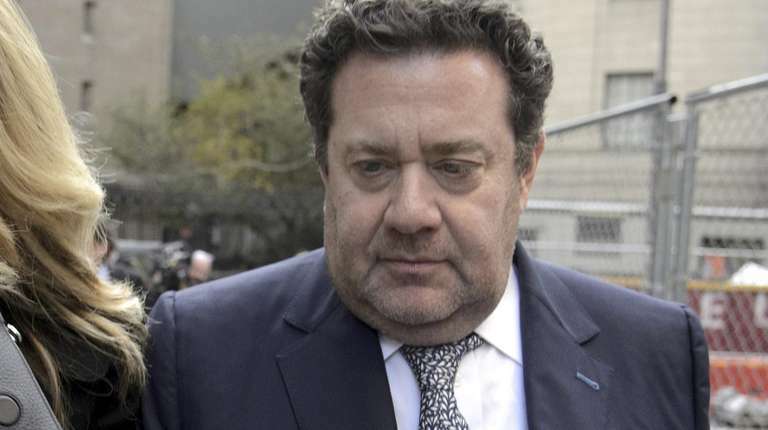 A hedge fund founder from Lawrence who was part of a scheme to bribe the leader of New York City’s correction officers union to invest $20 million in his firm was sentenced to 30 months in prison Tuesday, officials said. His attorney vowed to appeal the term. Murray Huberfeld, 57, who founded Platinum Partners hedge fund, was sentenced by U.S. District Judge Alvin K. Hellerstein in connection with the transfer of $60,000 that prosecutors said was used to bribe Norman Seabrook, the former president of the Correction Officers Benevolent Association, to invest tens of millions in Platinum. In all, the union lost $19 million of its $20 million investment with Platinum. As much as $15 million was from a retirement benefits program funded by the City of New York that invests money for correction officers’ retirements. Huberfeld pleaded guilty in May to wire fraud conspiracy. Specifically, he pleaded to conspiring with Jona Rechnitz, a real estate businessman and star government witness in several federal corruption trials, to cause Huberfeld’s hedge fund to pay $60,000 to Rechnitz’s company by falsely representing that the money was payment for courtside tickets to eight New York Knicks basketball games. Prosecutors said that money was really intended for Seabrook, a payment for making the investment of the union’s funds. Rechnitz had testified in Seabrook’s trial that he delivered $60,000 in cash to Seabrook in a Salvatore Ferragamo bag in 2014 after the union’s funds were invested with Platinum. Geoffrey S. Berman, the United States Attorney for the Southern District of New York, announced today that MURRAY HUBERFELD was sentenced to 30 months in prison for his role in a scheme to submit false paperwork to Platinum Partners (“Platinum”), a hedge fund founded by HUBERFELD, in order to facilitate a bribe to Norman Seabrook, the former president of the nation’s largest municipal correction officers union. HUBERFELD previously pled guilty to conspiring to commit wire fraud and thereby causing Platinum to fund a $60,000 bribe payment to Seabrook, which HUBERFELD intentionally concealed by falsely documenting the payment as one for courtside tickets to New York Knicks basketball games. As a result of the bribe, Seabrook caused the investment of millions of dollars of union funds into Platinum. Today’s sentence was imposed by U.S. District Judge Alvin K. Hellerstein. HUBERFELD was a founder of Platinum, a hedge fund that he had founded and continued to control unofficially even after his formal affiliation with the fund had ceased. In late 2013, HUBERFELD and Jona Rechnitz, an acquaintance and real estate businessman, sought to attract public and institutional investors to the fund. In late 2013, Rechnitz told HUBERFELD that a contact of his – Norman Seabrook president of the Correction Officers’ Benevolent Association (“COBA” or the “Union”) – would likely invest COBA money in Platinum if HUBERFELD were willing to pay Seabrook money. Over the next few months, Seabrook caused COBA to invest approximately $20 million of its funds into Platinum, including $15 million from a retirement benefits program funded by the City of New York that invests money for correction officers’ retirements. In or around December 2014, arrangements were made to pay Seabrook for the millions of dollars the Union had invested over the course of that year. Rechnitz paid Seabrook $60,000 in cash, delivered to Seabrook in a men’s luxury handbag. HUBERFELD and Rechnitz arranged for Platinum’s management company to receive a fraudulent invoice for $60,000 – generated by Rechnitz – that, on its face, billed Platinum for seven pairs of courtside tickets to New York Knick games given to Platinum by Rechnitz, who owned Knicks season tickets. In truth, and as HUBERFELD knew, the reason given to Platinum was false, and no Knicks tickets had changed hands. The real purpose of the payment was to reimburse Rechnitz, who had paid Seabrook for his efforts in securing COBA’s investments. Three days later, Platinum issued Rechnitz a $60,000 check. Over the next few months, Rechnitz, HUBERFELD, and Jeremy Reichberg, another co-conspirator, continued to work together to lobby Seabrook for more money. However, after a lawsuit filed by a former COBA board member referred to the Platinum investments, and the U.S. Attorney’s Office grand jury investigation resulted in subpoenas to Platinum and COBA in May 2015, no further investments were made. Ultimately, Platinum collapsed, and COBA lost $19 million of its investment. Seabrook was convicted of honest services fraud and conspiracy on August 18, 2018, after a 10-day trial in Manhattan federal court. On February 8, 2019, Judge Hellerstein sentenced Seabrook to 58 months in prison and ordered him to pay restitution in the amount of $19 million. On January 2, 2019, Reichberg was found guilty of honest services fraud, conspiracy, and obstruction of justice in connection with a separate scheme in which he and Rechnitz provided gifts and benefits to a number of high-level officers of the New York City Police Department (“NYPD”) in exchange for official police action for themselves and their associates. He is due to be sentenced by U.S. District Judge Gregory H. Woods on April 4, 2019. In addition to the prison term, HUBERFELD, 58, of Lawrence, New York, was sentenced to three years of supervised release, and ordered to pay restitution in the amount of $19 million. Mr. Berman praised the investigative work of the Federal Bureau of Investigation and the NYPD Internal Affairs Division. This case is being handled by the Office’s Public Corruption Unit. Assistant United States Attorneys Martin S. Bell, Russell Capone, and Lara Pomerantz are in charge of the prosecution. The foundation earned more than it granted. Salary and compensation may have been included in the money listed as “granted.” This is not overwhelming generosity. This foundation is one of many family foundations and businesses in which Huberfeld has his hands. If this organization has filed an amended return, it may not be reflected in the data below. Duplicated download links may be due to resubmissions or amendments to an organization’s original return. Nonprofit Explorer has organizations claiming tax exemption in each of the 27 subsections of the 501(c) section of the tax code, and which have filed a Form 990, Form 990EZ or Form 990PF. Taxable trusts and private foundations that are required to file a form 990PF are also included. Small organizations filing a Form 990N “e-Postcard” are not included in this data. We’ve created a guide for investigating nonprofits for those just getting started as well as for seasoned pros. Corrections Officers’ Benevolent Association – Press Release – a Platinum Announcement -$7M and no Use of Funds?